Tom Ashbrook (right) and Jack Beatty broadcasted live at the Online News Association conference in 2011. 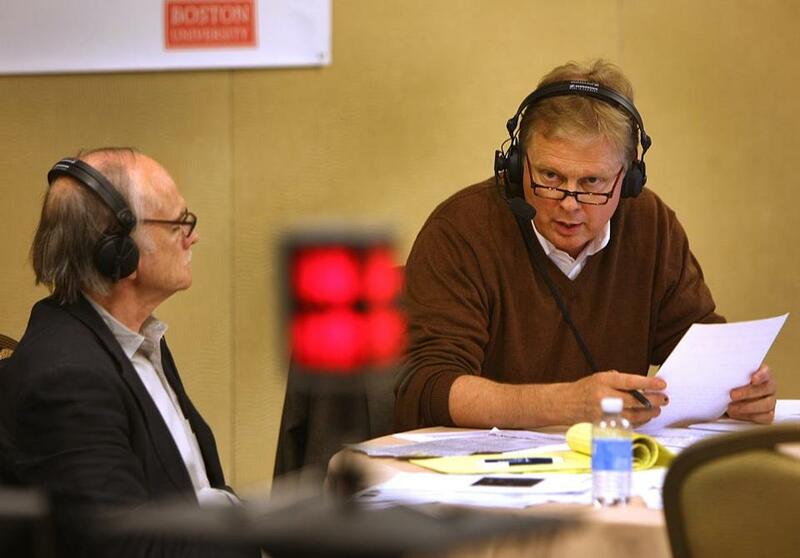 Tom Ashbrook, the talk show host and public radio personality, was dismissed Wednesday from his nationally syndicated program, “On Point,” after a review of workplace complaints concluded he had created an abusive environment at WBUR-FM. The Boston station, which produces “On Point,” had placed Ashbrook on leave in December after 11 former employees of the show — men and women — accused him of “verbal assaults, intimidating actions, consistent bullying, and unwanted touching,” according to a story posted on BU Today, Boston University’s website. The university operates WBUR as an NPR affiliate. A separate review concluded Ashbrook had not sexually harassed female staff members at WBUR. Ashbrook also signaled he may not walk away quietly, retaining Laura Studen, an employment lawyer at Burns & Levinson. Studen would not comment about potential legal action. News of the internal allegations against Ashbrook emerged in the wake of the Harvey Weinstein sexual harassment scandal when prominent men were losing their jobs almost daily. BU that month launched two reviews that concluded Ashbrook’s conduct negatively affected the “On Point” staff, and that WBUR management repeatedly spoke to Ashbrook about his behavior, without results. One review, by Longpoint Consulting, verified claims that Ashbrook had created an abusive work environment, according to the university. The second inquiry, by the law firm of Holland & Knight, found that Ashbrook’s conduct was “not sexual in nature” and that the host had not sexually harassed female members of his staff. About 60 people were interviewed between the two investigations, including accusers, employees, station managers, and Ashbrook, the university said. Nicksa said Longpoint Consulting will now help station managers make needed changes. “They will bring recommendations to us and to the station’s management team, and they will have an open door for any WBUR employee who wants to share their perspective or experience about how to improve or enhance the workplace culture,” he said. Charlie Kravetz, the station’s general manager, said the station must do better. “Despite the high-pressure nature of so much of our work, we must all be committed to a positive, respectful, and compassionate work environment in every corner of WBUR,” he said. WBUR remains fully committed to “On Point” and will “immediately begin a national search for a new host,” Kravetz said. The show has continued in Ashbrook’s absence with guest hosts. Ashbrook, a former Boston Globe editor, began at WBUR by helping provide live special coverage after the Sept. 11, 2001, attacks. He was a natural on radio with a baritone voice, easily navigating foreign affairs and other complicated topics while juggling callers. Within a few weeks, WBUR decided to hire Ashbrook and make the special program a permanent show. It was renamed “On Point” in 2002. Ashbrook said many listeners and former guests have offered him support. The question now is: Can “On Point” thrive without Tom Ashbrook? That may be hard to imagine in Boston, where he has been a local star. But media observers beyond Boston believe the show could use a reboot.